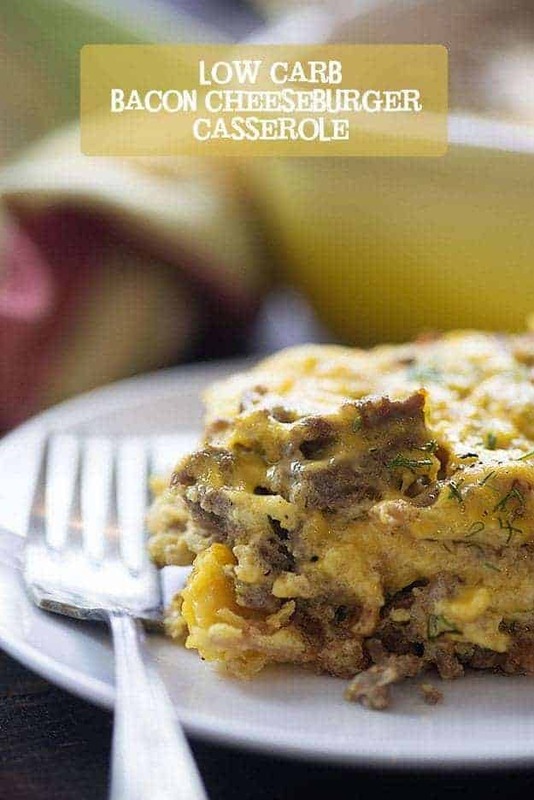 Cheeseburger Casserole - a low carb version of a family favorite! 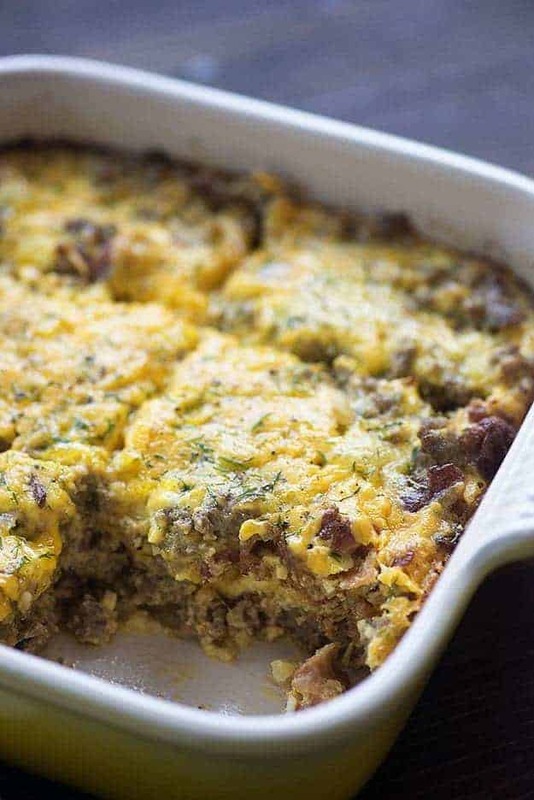 If you’ve been on the hunt for a low carb cheeseburger casserole, this is the recipe for you! Only 2 net carbs per serving and it’s so filling and delicious! Okay, friends, I have a good one for you today! You know how sometimes you just really need a big, fat, juicy bacon cheeseburger? Happens to me daily, if we’re being honest. Extra cheese on mine, please! I’m back on the low carb bandwagon again and one of those burger cravings hit. Of course, my bacon cheeseburger salad is always nice, but I’m getting a little sick of salad, to be honest. Maybe even a bacon cheeseburger? Because bacon makes life better, my friends. Soooo, I decided to whip up one of my new favorite low carb ground beef recipes. 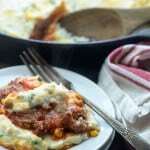 Now, the whole reason I need to be eating low carb recipest is because of casseroles. I’m obsessed with them and I eat them all too often. So, a low carb version is basically heaven, if you ask me! It doesn’t taste like diet food AT ALL. I mean, did you read about the bacon and cheese? This hamburger casserole recipe has been such a hit with you guys, that I created a taco version too! 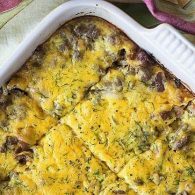 It’s one of the best low carb casseroles! Like woah. I served it with some cauliflower rice. My whole meal was only 5 net carbs and I was stuffed! Love dinners like that! Anyway, this is basically a crustless quiche, except not. I mean, I personally have never seen a quiche packed with so much meat in my life, but the premise is the same. It’s less egg-y than a quiche though. I’ve actually had a lot of people ask if this tasted egg-y and I really don’t think it does at all. 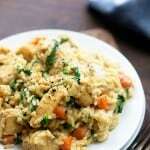 There are just 4 eggs in the whole casserole, so that’s less than one egg per serving. The eggs really just serve to hold everything together. 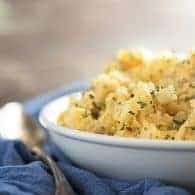 I’ve seen similar versions of this recipe all over the place, but I created this one with ingredients I always have on hand and to have as few carbs as possible while maximizing flavor. You can save on carbs by omitting the onion and Worcestershire, but I think the flavor they add is totally worth it. Especially considering there are only 2 net carbs per serving! 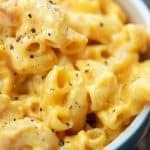 I really think you guys are going to looooove this recipe! Give it a try and report back! 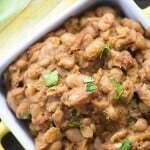 Give this a try with some diced red onion and pickles on top! Just note that any additional toppings you add will impact the carb count of this recipe. Oh, and I am sure to use reduced sugar ketchup. Heinz makes a great version and my kids don’t even notice the difference between it and the regular. You should be able to find it at just about any grocery store! 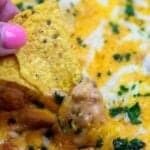 I’ve also made a buffalo chicken casserole based off of this recipe! It’s just a winning combo. 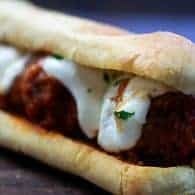 If you give this recipe a try, be sure to let me know what you think. You can share on Instagram and tag #bunsinmyoven or leave me a comment below! I’m always interested to hear how you like my recipes. 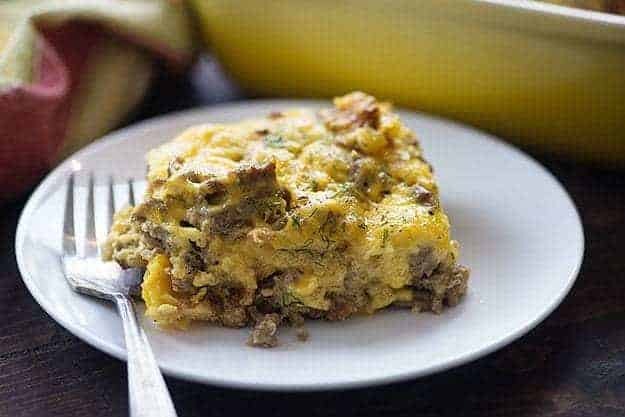 This low carb cheeseburger casserole is a family and reader favorite. 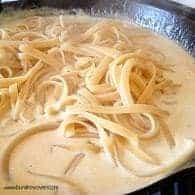 I've heard nothing but good reviews from everyone who's tried this simple recipe. I think you'll love it, too! Spread the beef mixture into a greased 8x8 baking dish. Top with the cooked bacon. I read through the comments looking for suggestions on it being freezer friendly -did see where someone cooked it and divided into single serving for later. My question is would it freeze well once assembled after cooking the hamburger mixture, allowing it to cool down well enough to sprinkle the cheese on top and then defrost over night in the frig and then cook? Hope I made sense – needing recipes that would freeze well for a week or so. Thanks! I haven’t tried freezing this one myself. Perosnally, I would treat it like a quiche and follow these instructions: http://missourifamilies.org/quick/foodsafetyqa/qafs310.htm Hope that’s helpful! I froze this without having the egg mixture on it and it did fine. I let everything cool then wrapped plastic wrap over it and topped with foil marking date, name of meal and how to cook it. I know this is a little late- but it freezes beautifully. I just fully cook it, freeze, let it thaw in the fridge and reheat by microwaving! Holy Crap! That has enough sodium in one slice to kill a frigging horse! Actually, that’s 1/2 of the daily recommendation, but still, super super bad for the arteries! Love the low carb aspect though. I am going to make and try substitutes…lower sodium bacon, cut out the teaspoon of salt, low sodium Worceshtershire, and that right there will probably bring the sodium down from 1075mg to 500mg. Much healthier for us heart patients! Looks yummy! As a person who constantly is hypokalemic and has issues with cramping sodium is a moot point. Those who follow a true keto lifestyle don’t concern themselves with “too much sodium” and “clogging arteries”. I think you may need to a little research. People in full blown ketosis must drink so much water that they are mineral depleted. I welcome mineral rich, unrefined himylayen salt and electolite suplements or else i risk serious cramps and even atrial fibrulation. Oh yeah. Im losing a pound a day and my bp is down 20 points and falling. Tryglicerides and cholesterol way down. Mental fog gone. I win all chess games and started 3 businesses and just bought a helicopter to land on my yatch. Well, the medical part is true…. You might notice this recipe was billed as low carb, not low sodium. One recipe can’t be all things to all people, woman. So you adjust it to suit your own needs and preferences. No need to blast the blogger! Apparently once our bodies go into ketosis, it flushed out a lot of water and salt. I just can’t believe I can eat this and lose Weight at 589 calories! Their is no portion size listed??? Also, aren’t we supposed to watch protein intake as well? The recipe serves 6, which is listed in the recipe card. 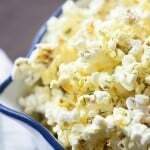 Not every recipe will fit your macros, but if you give this one a try I hope you enjoy. Made this tonight and it’s a keeper! Only changes that I made is I added 3 cloves of garlic instead of 1 and used dried dill weed as I didn’t have fresh. I used a 7″ X 11″ pan as the 8″ X 8″ seemed too small. It worked out perfectly. This is 5 stars! I will be making this regularly! Sounds delicious. Just started this low carb life. Not easy for an Italian girl who loves bread and pasta and cake. 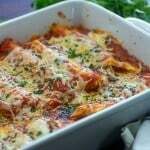 Your lasagna chicken got me hooked on following you. 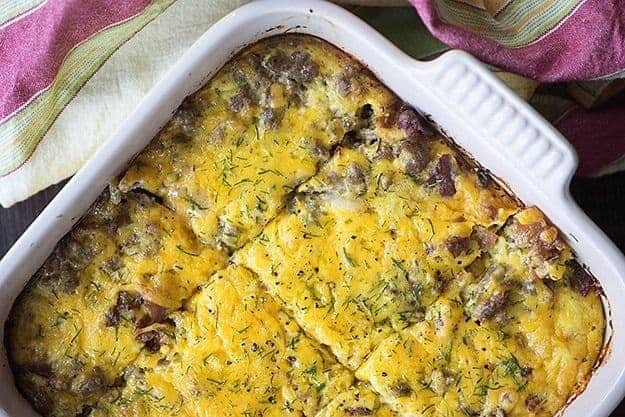 This casserole looks good to bring to my next bible study brunch. Can I assemble the night before and cook it in the morning?? Made this last night and it was great. I have a large family so doubled the meat but made some alterations to the recipe as I do a lower fat keto. Doubled the ground beef, kept the cheese at the original amount, doubled the eggs and cream, kept the bacon the same and added saluted mushrooms. Still plenty rich and all the family loved it. with keto you don’t want lower fat. keto requires high fat to work. I like the base of this recipe but think I need more veggies to balance out the richness. Anyone try this with cabbage or broccoli or just eat with lettuce and tomatoes? Can you double everything in the recipe to feed more people? Has anyone tried that? You should be able to double and bake in a 9×13. Just keep an eye on the time – not sure how it will affect that. I doubled everything except the eggs and milk. It still took 30 minutes to cook and it was delicious! I took it to a church lunch and brought home an empty dish ? 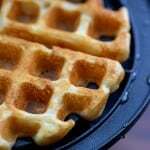 How many servings and what’s a serving size? Would it be ok to make it a day early and refrigerate it and bake the next day? This is a yummy dish. We’ve been making something very similar for 25 years. I always add chopped dill pickle. I love the addition of cream cheese. Thanks for more Low Carb recipes. I love this!! I make it once a week! Thanks for sharing! When I put this recipe in Carb Manager and divide it by 8 servings it comes out to 3gm Carbs per serving. I used My Fitness Pal to calculate this one based on the brands I used. Is this total carbs or Net carbs?? Unfortunately, I need to count the total carbs, not just net…. Also, what would you consider a serving size?? 6 ounces?? This is total carbs. I didn’t measure the serving by volume. Just cut into 6 equal sized pieces. can you replace the heavy cream with skim or 2% milk or anything else lower in calories? Yep, it’ll change the carb count though. I put turkey bacon on top last night and my Hubby , 3 sons wiped it out. I got a serving to eat of it lol! I used ground turkey instead of ground beef (it’s what i had on hand). I used fresh salsa instead of the sf ketchup (because I didn’t have any). and I used dehydrated onions because I didn’t have any fresh on hand. Trying this tonight! Sounds great!! So glad you loved it! The swaps sound delicious! We really enjoyed it. The next time that I make it (which will be soon) I am going to try putting some pineapple chunks in it. I made this tonight. It is delicious! Served with 2 oz of arugula drizzled with olive oil. I plugged the entire recipe into MyFitnessPal.com and I got 5 carbs per serving! Still not bad, but I’m just curious how is there a discrepancy between 2 carbs and 5 carbs? Either way it still is a keeper for me. This was Delicious!! I did add chopped dill pickles bc the tang really cuts the richness! and I also added a bell pepper, mushrooms, and tomatoes for bulk and to add in some vegetables for the kiddies. Came out Amazing! Thank you for the recipe! Perfect comfort food! Added sliced Roma tomatoes on top, sprinkled with green onions and dill. Very nice! Made it tonight and will make this again. I’ll make 2 hanges for next time. I think I may have over drained any grease from the beef and the bacon. My casserole was a bit dry and I thinking I went unnecessarily overboard. Second change is no worchestire. I love the stuff, but there was a strong sweetness that I would rather go without. 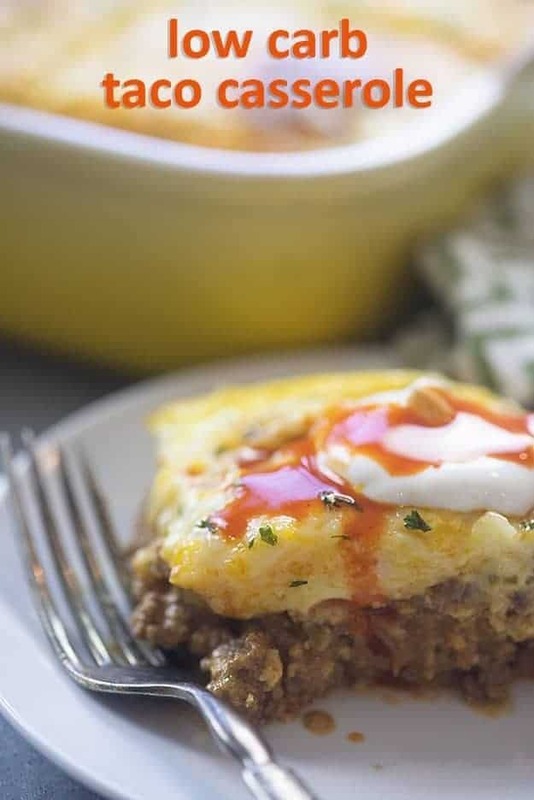 I put your recipe for the low carb cheeseburger casserole into Carb Manager and Macros are off from what you have posted, the only changes I made was no hot sauce and no fresh dill. That is based on six servings. A friend made it for me and I did find it very good. That just seems like a lot of carbs especially with not adding a side to it yet. I did the sweet onion at 3oz, omitting the sweet onion only decreased it by one carb. Hi Steve – I calculated this using the brands/ingredients that I used with My Fitness Pal. Your results will vary based on the specific products you use. EGG ALLERGIES – HAVE YOU MADE IT WITHOUT THE EGG? No, the eggs bind this together and are a pretty important part. You could leave them out, but I’d skip baking it and maybe just eat the mixture with a fork. How does it hold up to reheating for left overs? How many days would you say it could keep in the fridge prior to reheating? 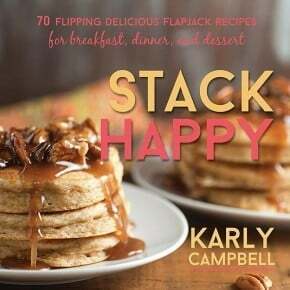 I’m making it tonight and we are super excited to try it! It reheats great! I tend to be more conservative with leftovers, but I think this would last 3-4 days just fine. Recipe calls for 4 tablespoons of cream cheese. Any chance you meant to type 4 ounces? 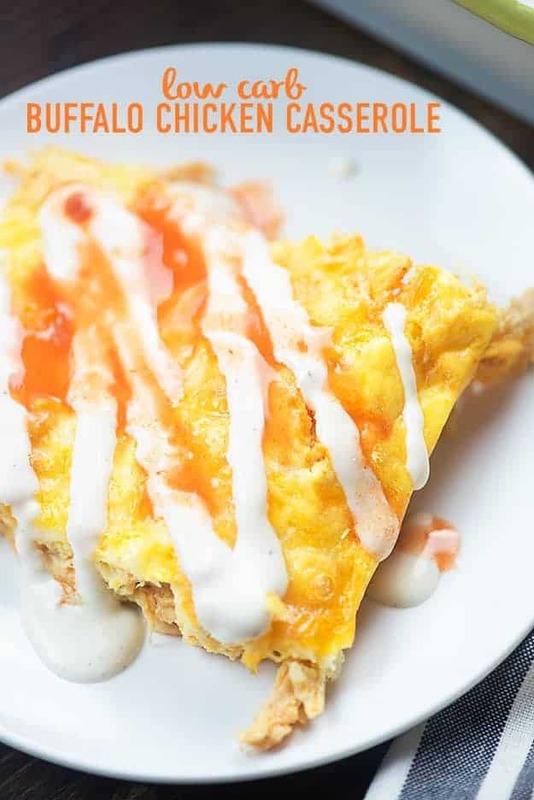 I only ask because all the low-carb bloggers that post casserole recipes (with cream cheese) always call for 4, 5, 6, 8-OUNCES of cream cheese, like the block of cream cheese has printed on the foil outerwrap.